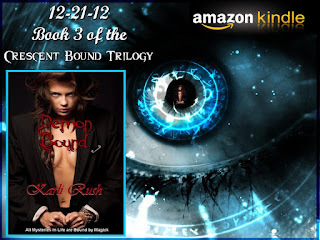 It is the coming of a New Year and if you are into Supernatural fantasy and modern witches, and suspense, check out this Bewitching Author, Karli Rush, below is her trilogy, her Amazon Author Link and of Course Demon Bound, third book of a haunting and wicked trilogy. All I can say as a reader is Wow, this third book of the Crescent Bound Trilogy is all and so much more. "This third book of the series was powerful, sensual and an insightful plot, full of suspense and conflict that was a delight to read.There is many secrets and entertainment all packaged in a modern trilogy that haunts the reader's mind. The ending was a fiery climax, yet as the series is full of secrets so is the future of this author's creativity, this story was a stimulating and entertaining trilogy of the supernatural. Highly recommend this author if you are into a wild ride of reading and increased heartbeats as each character is faced with a confrontation and a sigh when the story concludes or does it?" Crescent Bound, Book 1 was the first of the trilogy, it was the one that got me hook, and two and three were supernaturally entertaining. Presenting the Awesome Third Book of the series, Demon Bound is available on Amazon on the 21st, so now you can see how this haunting trilogy concludes. It is a story about witches, covens and mysteries and their beliefs, continuation of the first book Crescent Bound. It starts with Alyssa and Marc bonded as a married couple and their love is so deep they can feel each other's pain or confusion when separated. The author starts the story off with the couple and friends and their hobbies which was cars such as Mustangs and top of the line motorcycles, and their daily interaction with their friends who are all witches. It was entertaining to read about their outings and other interests, such as the songs, clothing and other daily topics young people are interested in. Then the story becomes more chilling as Alyssa is in trouble and goes missing. She was kidnapped and her husband Marc who is an ice element is very lost and furious that he did not protect her. Marc, her father, who is the Head Witch and others covens come together and planned a search and rescue Alyssa mission. Meanwhile Alyssa, an unique and powerful witch not aware of all of her powers just yet was held captive by a cruel Dr. Jekyll and Hyde powerful dark witch, Nate, and he is cruel to her, punishing her, torturing her and keeps her disoriented, stealing her goodness, her light and turned her towards the darkness he craves. He is abusive and used black magic and poisoned herbs to erase her memory of all good in her life, her Marc, family and friends. This intention was to manipulate her into using her gifts of healing and other talents for Nate and his henchmen to be healed when they are injured by their human hostages, who struggled against their captivity. Alyssa in her disoriented drugged state realizes Nate was a madman and he wants authority of all witches covens by destroying one coven at a time and targets for another and Alyssa was the key to unlock his future reign of dominance of the witch’s realm, declaring her as his alleged life-mate and brainwashed her to obey only his commandments. Her husband who is hot and sensual sensed her dilemma and felt all her emotional and physical pain she was enduring and desperately wants her back and safe in his embrace. They followed leads and when they challenged the dark witch and his henchmen in a battle of the elements they are defeated and retreated but come back for another match and this is when the intensity of the story becomes interesting and compelled this reader to stay up late to see justice given to the bad guys and Alyssa path back to recovery. The dark magic toxins were coursing through her veins and it might be too late for the high twelve witches of the world to reverse the spell. Marc and all who loved Alyssa waited in anticipation to welcome the old Alyssa or a stranger back to their lives. The passion and the love they have for each other was sensual enough to make this reader to desired to have a glass of ice cold water next to her when reading the intimate connection between the two life mates. It was refreshing details of hints of their commitment to each other and all they cared about, which is more alluring then right out description. The conclusion was breath-taking and the glimpse into the witches’ rituals was exhilarating to feel the goodness and light pour out of the pages.